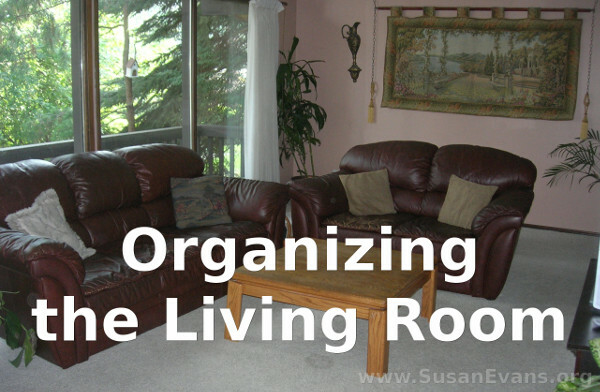 Living rooms aren’t very hard to organize, since most people only have couches, a coffee table, a TV on a stand, and maybe a few bookshelves or plants. So what can I possibly have to say about living rooms? First off, you need somewhere to store videos or DVD’s. You can find drawers designed specifically for videos, and they can be out of sight. Or you can put them in regular drawers, if you have any under your television. You might even store them in a closet or in another room on a bookshelf, to keep the living room looking relaxing and luxurious. Wii games have lots of parts. You might store those in a clear bin before putting them in a cupboard. That way, they don’t tumble out of the cupboard and get stepped on every time someone plays Wii. 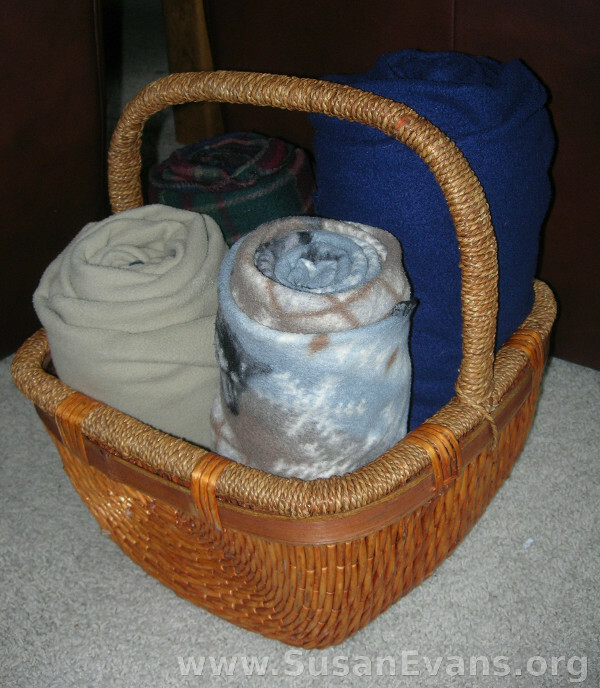 Baskets can be used in your living room for rolled up throw blankets for when you watch television. I have a small basket for reading materials for one of my sons who does silent reading for an hour after lunch. You could also put devotional items in a nice basket wherever you like to spend time with God. Baskets are fabulous for containing all kinds of things, like sewing, that you might want to do while watching TV. Bookshelves are the correct storage place for books. Consider getting taller bookshelves that go all the way to the ceiling to free up more floor space. A taller bookshelf takes up only half the floor space as two shorter bookshelves. If you have too many books, either get rid of some of them, or get more bookshelves. You can also store items on hanging shelves on the wall. In my living room, I have a beautiful assortment of medieval items that I bought at yard sales when I lived in England. I love looking at those items every day, grouped together with a few plants to add a relaxing atmosphere. No floor space has been taken up by the hanging shelves. These are also useful in children’s bedrooms. The children’s toys can decorate the rooms as they are stored on the wall. Always remember that you can find storage spaces in corners, above your head, on the wall, or underneath furniture, and your visual floor space will be freed up to make your home look more organized. This entry was posted on Thursday, August 19th, 2010 at 7:18 am	and is filed under Organization. You can follow any responses to this entry through the RSS 2.0 feed. You can skip to the end and leave a response. Pinging is currently not allowed. I’m in the process of needing to add another bookshelf to our living room and potentially a hanging shelf. We’re a family of readers! Bookshelves are the most efficient way to store books. I’ve been looking for a basket to roll up our blankets. I saw a neat one at Target that was metal and would go perfectly in our home. The kids can then help keep blankets tidy! I love the way the rolled blankets look in the basket! We have pretty much killed out DVD collection. Rightfully so. We’ve kept our favorites, but mostly everything has been donated. They really were taking up a lot of useful space, where I could be placing books! 🙂 Great tips for decluttering the living area! De-cluttering always helps to alleviate visual crowding, and empty spaces relieve the eye and create calmness.